Bad breath is often caused by bacteria in the mouth. This bacteria can hide on the teeth, under the gums, and on the tongue. It makes sense that if you can get some of the bad bacteria out of your dog’s mouth, their breath will improve. Enter Orapup. Hearing my plight for super-easy ways to knock Chester and Gretel’s nasty breath down a few notches, they sent us one to try. Orapup is actually the doggy version of the world’s best tongue cleaner for people – Orabrush. Both are tongue brushes with bristles designed after a surgeon’s scrub brush – the ones they use to clean bacteria from their hands before they perform surgery. The bristles on the Orapup are made of ultra-soft material that is designed to clean into the crevices of the tongue and loosen bacteria. In between the bristles are four scrapers that collect the bacteria the brushes remove. The makers Orapup didn’t just slap a dog on the package of the human version. They spent a lot of time designing a similar product your furry friend would like using. 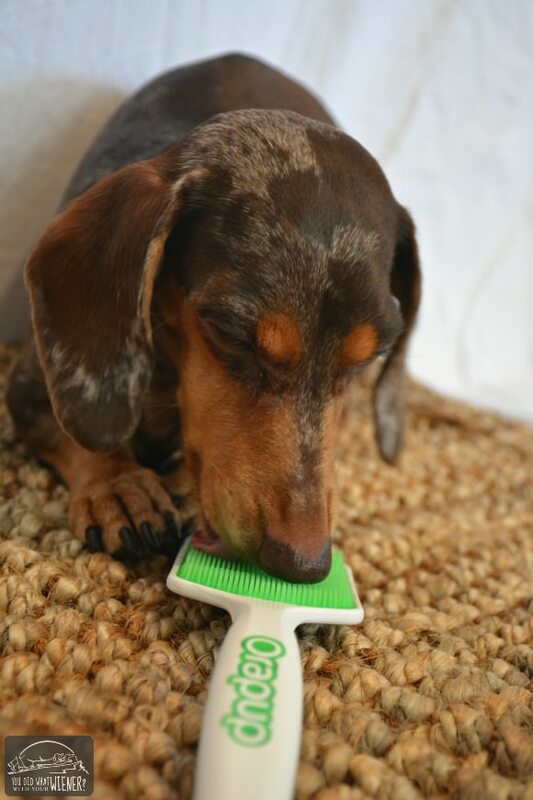 The brush is wide enough to fit the tongue size of most dogs and the handle is comfortable for you to hold while your dog licks it. So how do you get your dog to lick the brush? The Orapup system comes with a bottle of tasty Lickies gel. Lickies contain all-natural enzymes to fight bad breath, reduce plaque and tartar build up, and promote healthy oral hygiene. The enzymes help build up the good bacteria on the tongue in order to protect against future bad breath attacks. The paste works without killing the mouth’s natural defenses against odor-causing bacteria. After you put about 1/2 tsp of the Lickies on the brush, your dog will get the idea that they have to lick the brush to get a taste of the goodness. Watch this Chihuahua, Dachshund, and two other pups try out the brush. As you can see, they take to it right away. 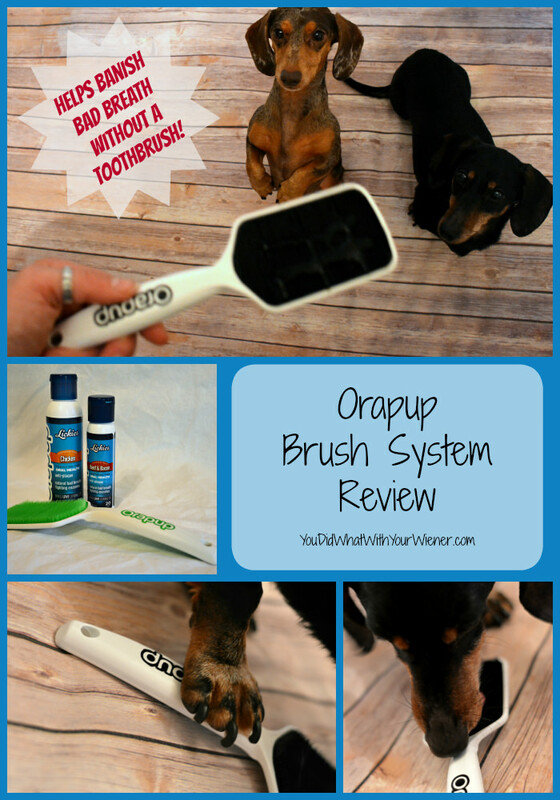 What Did We Think of Orapup? Chester and Gretel loved it! I found out right away that they can’t both lick the same brush at the same time. Neither one of them has any issues with food guarding but Gretel actually growled at Chester just a bit when he tried to move in on the brush she was licking. Luckily, we have two brushes so they can each have their own. We were sent Lickies in both flavors – chicken and beef and bacon. They licked both with equal vigor. I liked the Orapup system because it worked. I gave Chester and Gretel the brushes to lick for 10 minutes a few days in a row and then did a sniff test on their breath. I was a little taken aback that their breath didn’t smell “clean” and minty. I am not sure what I was thinking though because – DUH! – the Lickies flavors are meat based and designed to fix bad breath, not cover it up with some foo-foo smell. I liked the Orapup system because it’s super easy and simple to use. First, since Gretel and Chester don’t try to eat the brush, I can lay it on the ground for them to lick away at (under close supervision of course). I can put the brush on the living room floor and do dishes while they help clean up their breath. It seems that I might not have to remember to do it every day either. A lot of positive reviews I read said that the dog only used the brush 4 or 5 times a week. It’s also not messy. The Lickies gel is a bit runny but I didn’t have any problem with it getting on the rug, even when the brush was briefly flipped over. It’s super easy to get the remaining Lickies off of the Orapup brushes by running them under hot water for a few seconds. You can order the Orapup system for your dog at a 40% discount here. Shipping is free in the US and every purchase comes with a 60-day money-back guarantee if you are not satisfied. You can also watch several other review videos here (scroll toward the bottom of the page to see them). Have you tried the Orapup system? What did you and your dog think? Also let us know if you plan to order it then come back to give us your opinion (and show us a picture) on our Facebook page. Ah this looks great! I can never be bothered with the hassle of brushing my dogs teeth so this seems like a much easier alternative. I wish they supplied to the UK. It looks like they used to but dont currently. That’s too bad. Have you tried contacting them to ask? What about ordering from Amazon? Great review. So you were happy with the ingredients in the gel? I’m always nervous about flavored products, because of Rodrigo’s digestive system. For our dogs, I’ve found that using a digestive enzyme cures bad breath. I add a powder to their meals. This product sounds like a great alternative for dogs that need an extra boost or where a supplement doesn’t work. This is really interesting! I echo your thoughts about finding an alternative to brushing teeth – I am terrible about doing it regularly. Can you share approximate cost? It looks like I have to sign up for their newsletter before I can shop? Do you know if this is sold at national pet retailers or just online? Really curious about this little tool! Hi Lynne. Orapup is only available online as far as I know. Stores like Petsmart and such don’t carry it. I believe. The Orapup double pack available through my link, at a 40% discount for signing up for their newsletter, is just over $30. That included two brushes and two bottles of Lickies. A package of one brush and one bottle of Lickies is also available on Amazon. Great review, I find the Orapup interesting. I’ve read some reviews regarding dogs don’t like it’s taste, but still I need to buy for me to know. I don’t know… I would be surprised if a dog didn’t like the taste. I mean, unlike the “minty” stuff, these flavors are chicken and Beef and Bacon. What dog doesn’t like those things? I admit my dogs are NOT picky though. I don’t know what it’s like to live with a picky dog. Maybe there are some that don’t like it. Feeding a real raw diet means no more dentals, no brushing their teeth, no bad breath, no body order and so much more. Wait till you see!